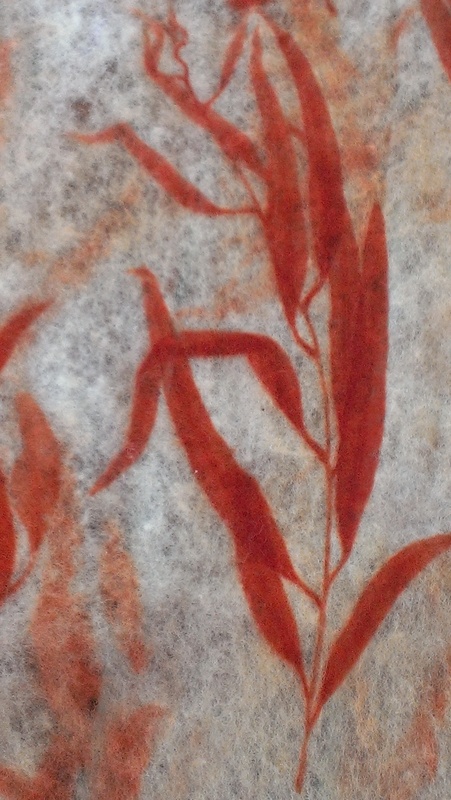 I’ve spent a good deal of time trying to figure out how to get stronger colours, and especially red to burgundy, from Eucalypts. I’ve had occasional, but not dependable, success. I have had the thought that the temperature of a dye bath might affect the colour obtained from eucalypts several times. In particular, I’ve had the thought that relatively low temperatures might be required to obtain reds. Bear with me in my ignorance about chemistry… I’ve had this idea when thinking about the way that madder turns toward brown if heated too much. The chemical constituents are not the same, but perhaps their reaction to heat could be. I’ve had the same idea reading the inspiring Karen Casselman’s Craft of the Dyer, in which she mentions that tannin bearing plant dyes will move toward brown if overheated. I’ve certainly obtained many oranges from boiled eucalypt dyebaths. I had this idea about reds and temperature again reading this glorious and informative post by Dustin Kahn and her comments. I had it when reading Ravelry and coming across very infrequent references to people achieving red from eucalypts of unknown variety, in which I’ve noticed slow cooker or crockpot methods seem to get success sometimes, suggesting low temperatures and long processing. I’ve noticed that when I’ve achieved red or maroon shades I’ve considered temperature to be a factor sometimes. I used to use two gas burners that would do ‘boiling hard’ or ‘blowing out’ with only luck in between, and a lot of turning on and turning off to manage my results. Now that I have hobs that will allow relatively finely tuned temperature control, I think it is time to test this theory a bit more systematically. I’ve tried to test it before and been unable to replicate anything close to red. 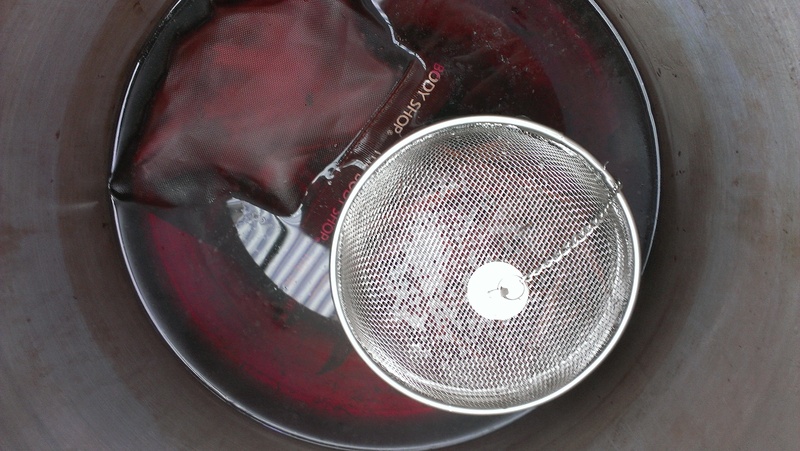 More recently I tested it again and felt that while keeping the pot at a simmer close to but below boiling is a good idea in order not to create felt, the lower temperatures I trued did not generate reds and sometimes were too low for good fixation. For the time being I am letting go of my temperature theory. So what are the other factors? 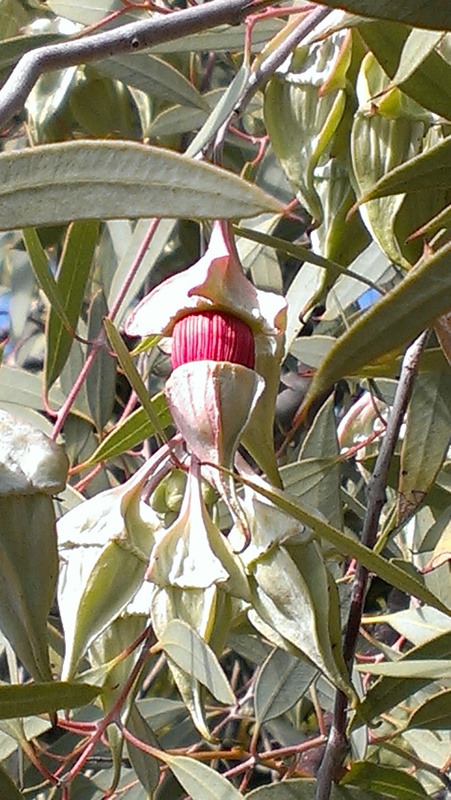 It is beyond question that the variety of eucalypt will predict the range of colours that are possible. 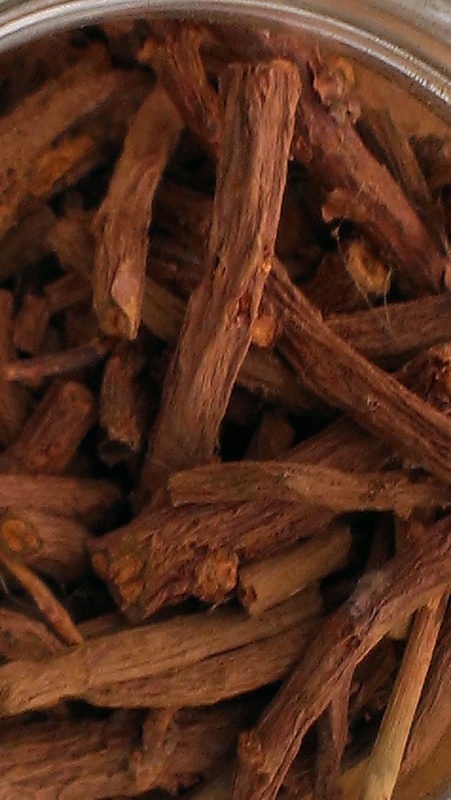 I have best results with E Scoparia, E Cinerea, E Kingsmillii Alatissima and E Sideroxylon in the red range and of these, the best is E Scoparia bark in my own experiments. I’ve found that sheer quantity of dyestuff to fibre is a factor in achieving any strong colour, certainly including red, but it is not a guarantee. Dustin Kahn reported using 340g fresh E Sideroxylon leaves and stems to 10g yarn to obtain brick red (and then achieved yellow and orange on two other 10g skeins). I am convinced that time is a factor. Rebecca Burgess and Dustin Kahn both report heating their dyestuffs for long periods with cooling in between (which I have found changes the colour but not in a red direction necessarily). The redoubtable Ida Grae reports achieving red from E Cinerea only after 3 hours of simmering. India Flint recommends acidity as influencing brightness of colour, but I have to admit having tried it without being confident it made a difference–hence, more experiments needed, preferably with higher acidity levels. At a recent workshop, we had two E Scoparia bark pots running. We did a trial and put vinegar in one pot and not the other. The no-vinegar pot gave brown on alum mordanted superwash wool and alum mordanted alpaca. Brown surprised me, but I wouldn’t usually use alum. We’d run out of unmordanted wool in the mix that day. In the with-vinegar pot, grey handspun wool with no mordant came out burgundy, which was very exciting! Polwarth locks with no mordant came out brilliant orange, and the alum mordanted skeins of alpaca and alpaca blends came out toward the red end of orange. We cooked them on as low a heat as we could–but the no vinegar pot was bigger, so heat control was easier. So… I am continuing to experiment with favourite species, no excessive heat (wasteful in any case), a high ratio of dyestuff to fibre and acidity. 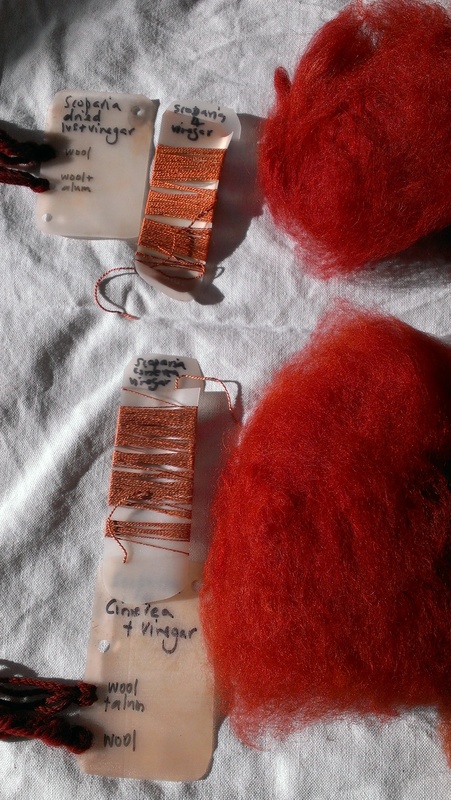 Here are the latest findings: red on alpaca! Burgundy on the wool samples, rosy pink and orange on silk thread. The top sample used E Scoparia (dried leaves) and The lower samples used dried E Cinerea leaves, both with white wine vinegar. 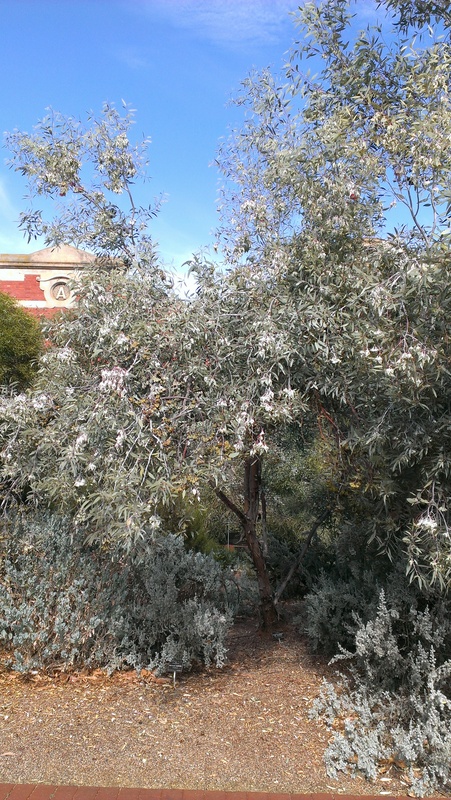 How spectacular is E Kingsmillii (Kingsmill’s Mallee; wing-fruited mallee)? Perhaps the tree doesn’t seem obviously wonderful. The buds are truly glorious! And so are the flowers and the fruits. It turned out I was photographing this tree outside the Botanical Gardens centre for plant diversity. 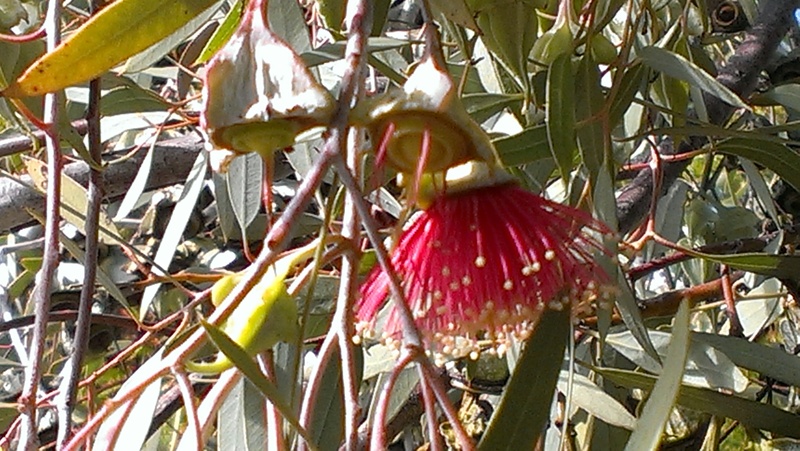 My eucalypt admiration was shared with a woman who came by and offered me more information, so I told her about this beauty being a dye plant. It isn’t every day you get this kind of fun on your way to a conference! The second in my little series of workshops at the Guild went really well. 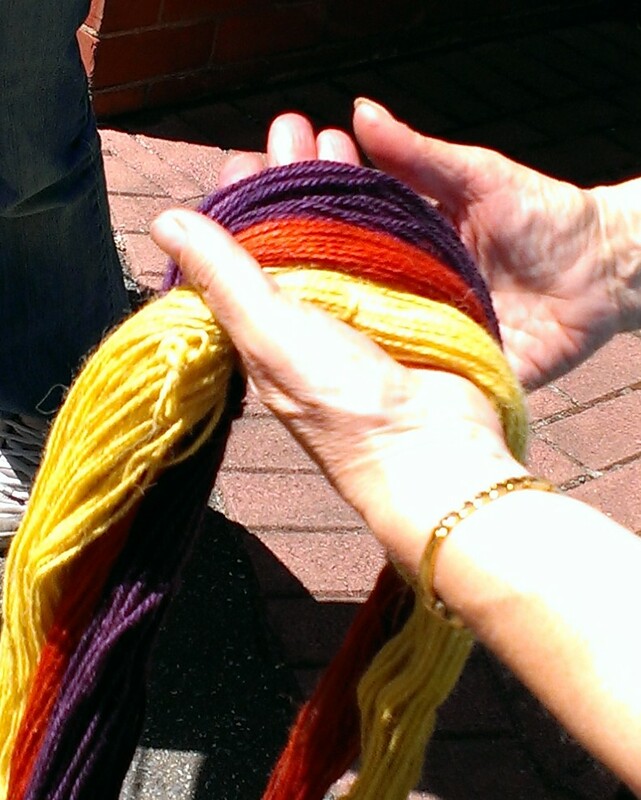 There was yarn, fleece and roving dyeing. 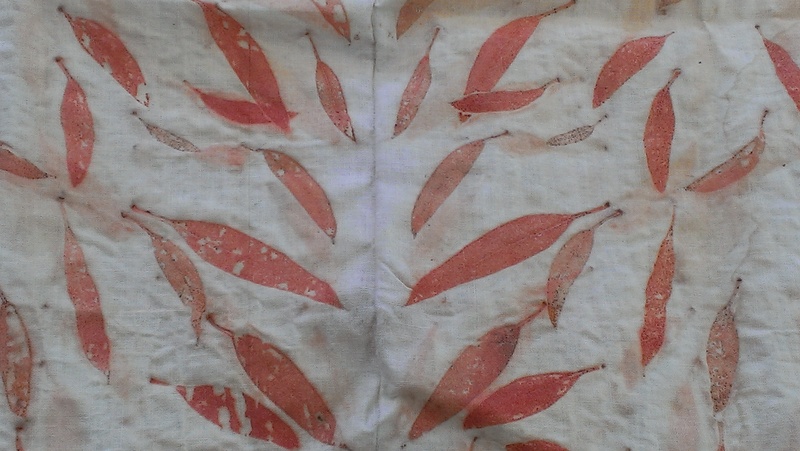 Brown, orange, almost-red and maroon from E Scoparia (bark and leaves) and E Cinerea leaves, yellow from silky oak (Grevillea Robusta) using Ida Grae’s recipe from Nature’s Colors: Dyes from Plants, and the ever-astonishing purple from red sanderswood with alum. I again used Jenny Dean’s method from Wild Colour and still got nothing like the oranges she suggests are likely. 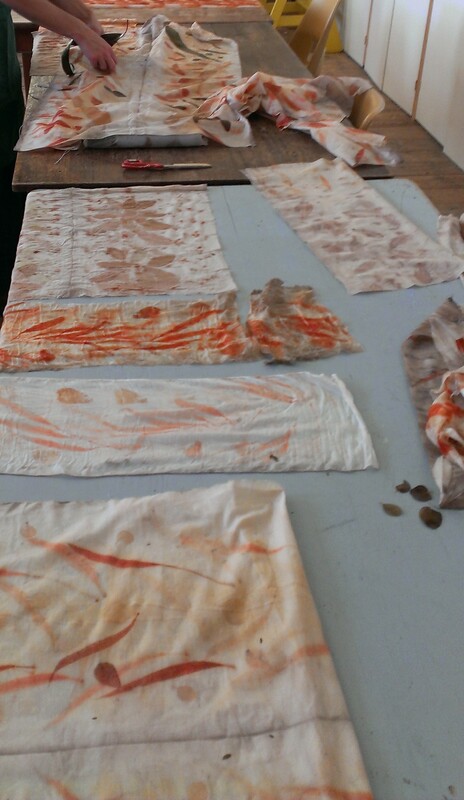 Mysterious outcomes in natural dyeing are not all that uncommon (at least for me! ), as the number of variables is so huge. But this one is out of the box–purple!? Since my last post on the subject, Jenny Dean has very generously been in touch with her thoughts on the matter. She suggests this purple could be the result of alkalinity (but given I made no attempt to generate an alkaline bath, it seems unlikely it was seriously alkaline). Or–and I agree with her that this is much more likely, even though I used 4 different jars/packs labelled “sanderswood”–perhaps the dyestuff was never sanderswood to begin with. The colour is very, very like the logwood results I have had, just about indistinguishable. I am still not complaining about the result–I love purple and so did the participants. I was hoping for purple on this occasion, as I have no more logwood–that I know to be logwood. Perhaps there was a time in the past when a batch of “sanderswood” came to our Guild or a supplier nearby and all the different jars I’ve used ultimately can be traced back to the same mislabelled supply. 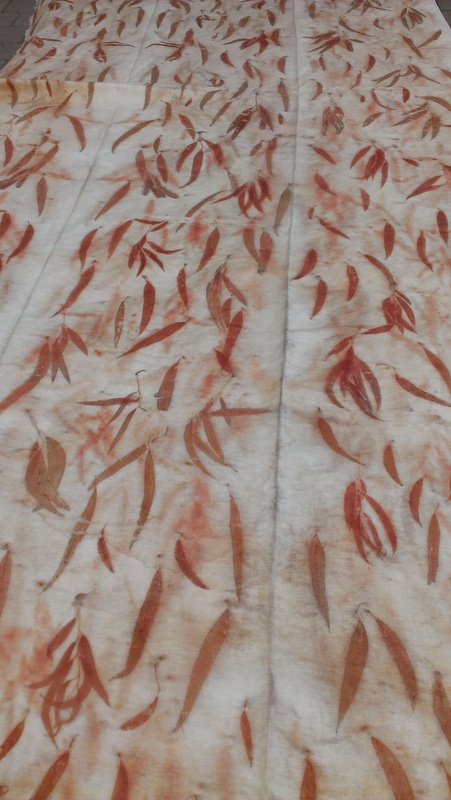 This would fit with my experience of Eucalypts… it is much more likely that I have misidentified my tree than that the dye bath is giving a completely different colour. Variation to some extent, however, is completely expected. Here is the “sanderswood” just after I poured boiling water over it–Jenny says this looks like a logwood bath to her. I bow to her much more extensive experience and wisdom, without hesitation. I have the biggest chips in a little zippered mesh pouch that must once have held toiletries. The smallest chips/splinters are in something that looks just like a giant tea ball. I saw it for sale in a Vietnamese grocery where I was investing in greens, seaweed and soy products and immediately saw its possibilities. The woman who sold it to me had an eye-popping moment (evidently she hasn’t sold one to an Anglo before), and asked me what I was planning to do with it. I love those moments in Asian groceries, because once I’ve been ask the question and given my (admittedly bizarre) response, I can ask about the ordinary use of the device or food in question. 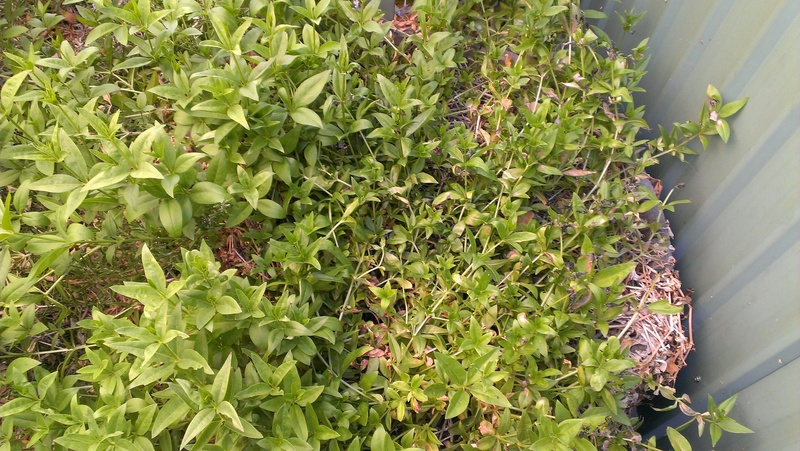 This one is usually used to contain whole spices when making a big pot of stock or soup. This point was helpfully illustrated by a packet of soup seasonings–star anise and cinnamon and coriander seed were some of the spices I could identify right away. 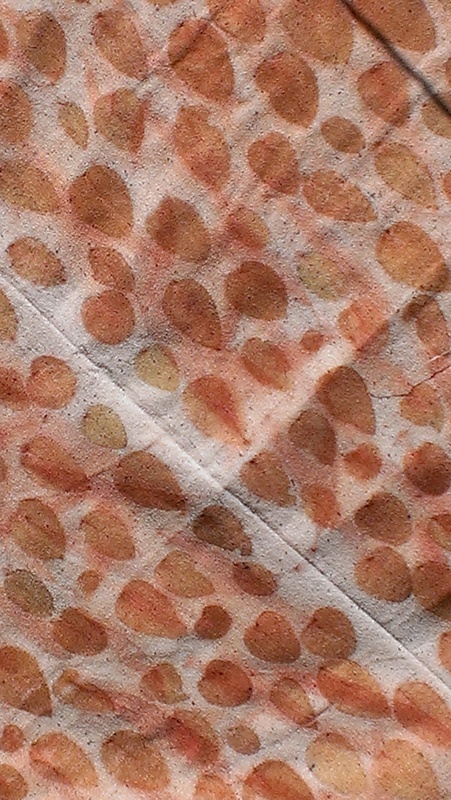 People tried out India Flint‘s eco-print technique on cotton, wool prefelt and silk. I hope she will get some extra book sales as a result (if you’d like to acquire her books, click on the link to her blog and look for the option to buy them postage free in the left hand sidebar). Wool prefelt… the degree of detail is fantastic. This is destined for felting experimentation by a dear friend who generously assisted me at the workshop. Her practical help, support, constant grace and good cheer made things go so smoothly. I also decided to start some processes before participants arrived, which I didn’t do at the previous workshop. I think that helped. But it was a fabulous group of people too. And finally, silk/hemp blend, destined to be made into a shirt (by me, so it may take a while). I am delighted with how it turned out, after many months of putting off the day. 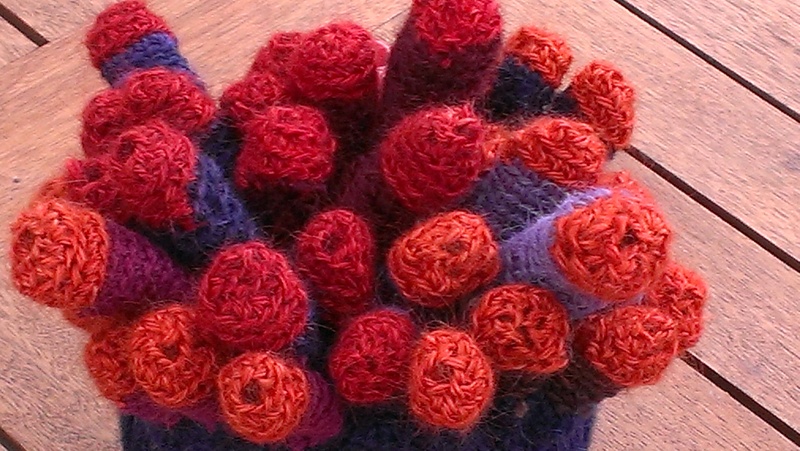 These are madder-tipped, logwood-stemmed crocheted coral thingummies, inspired by Loani Prior’s ‘coral punk’. When I say ‘inspired by’, let me confess. I bought her beautifully designed and entertaining book Really Wild Tea Cosies with a Christmas book voucher I was given. So I had the pattern. But even though only one, basic, crochet stitch was involved, my crochet skills are decidedly remedial and I don’t happen to have a crochet instructor on tap. I turned to Maggie Righetti’s book Crocheting in Plain English (I don’t have the new revised edition, needless to say). Apparently sometimes I just can’t believe what I am reading… or perhaps I just don’t understand on the first eight passes. I see students I teach with the same difficulties! 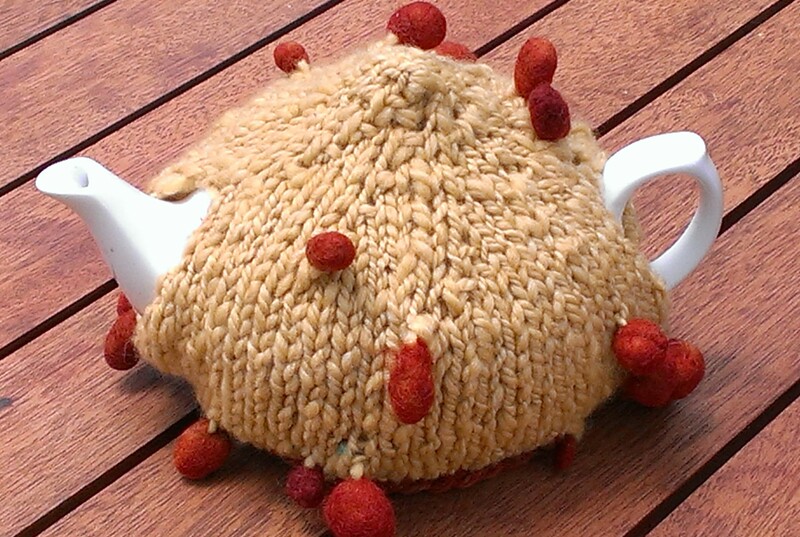 By the time I had finished this tea cosy and started on the next, I’d managed to figure out that I wasn’t doing what Loani Prior must have believed was involved in the one stitch involved in her cosy. Luckily for me crocheting badly still produces a fabric of a sort. I also figured out that for me, improvising a knit version of the pot cover itself was going to beat freeform crocheting one as the pattern suggests with my inadequate skill set. So that’s what I did, and Loani Prior shouldn’t be held responsible for the outcome. I like it anyway. It has highly entertained people who watched me crocheting coral at parties (as one does) as well as those who have seen the finished object, many of whom thought immediately of a sea anemone. Let it be said that at present coral punk is not alone. 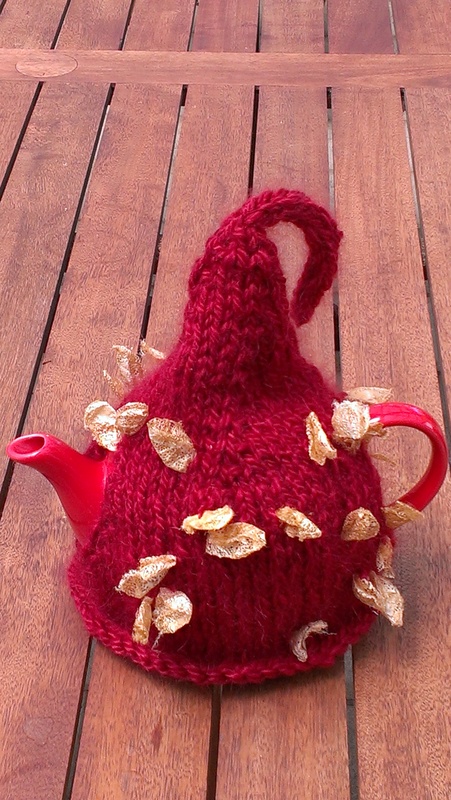 Here is the present plain Jane of the tea cosy selection at our place: yellow from silky oak leaves and orange from eucalyptus–with the felted blobs spun into the yarn. Pattern improvised. 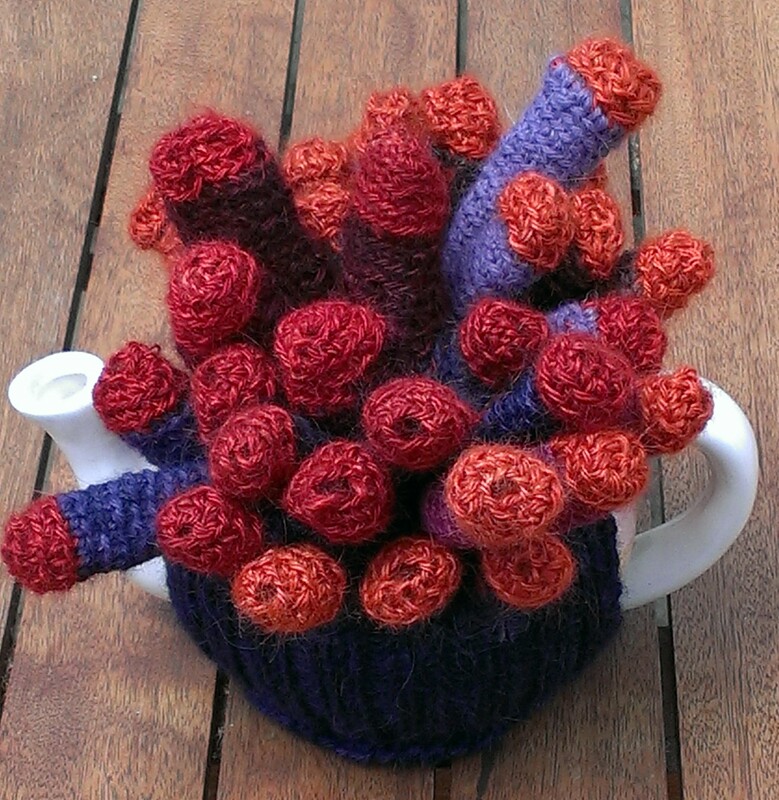 Luckily, tea pots are just not that fussy about how you clothe them. I’ve been branching out and using up some particularly strange art yarn spinning experiments. This next one is commercially dyed mohair with silk curricula cocoons spun onto it. Scratchy for a head, perfect for a teapot! I was surprised how many people liked the look of the ‘hat’ emerging as I knit this at a picnic, riffing off Funhouse Fibers’ Fast and Fun Cozy. Once again, that is to say, dispensing with the pattern when it became inconvenient. I guess the hat admirers hadn’t felt the yarn yet. And for anyone who is wondering, I have continued to dye with the logwood exhaust from the dyeing workshop. I ran out of yarn for a while and dyed two, 200g lengths of merino roving. This morning I pulled out another 100g of superwash yarn. I think it might be just about done, and I only wish I had kept a record of the weight of fibre that has been dyed with what was a small quantity of logwood in the beginning! 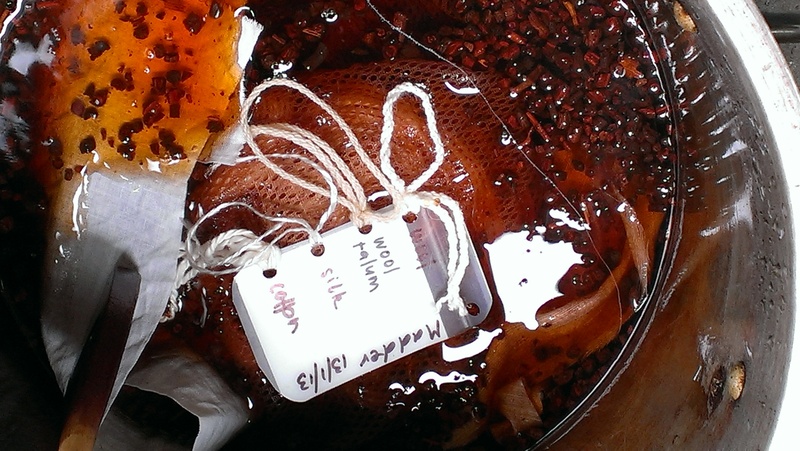 This weekend, the second in a series of two natural dyeing workshops. I’d better eat my crusts and get my beauty sleep in preparation. I left fibres soaking in the dyepot for a week afterward. And here they are after drying. 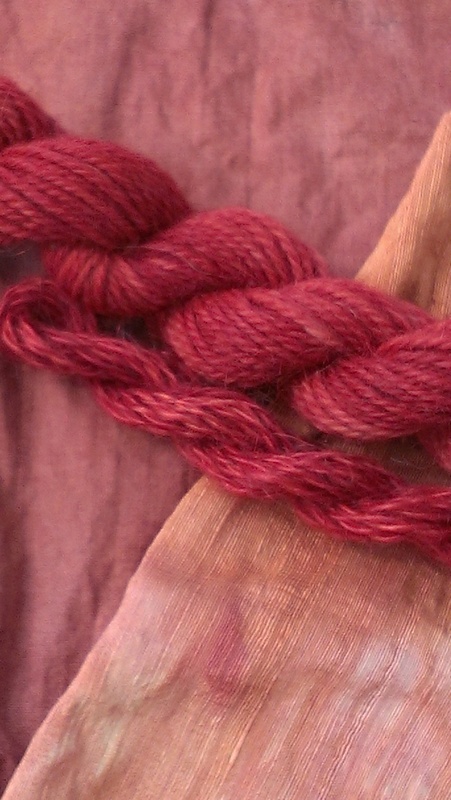 The alpaca/wool (larger skein) is really red, and so is the smaller skein of mohair. The cotton mordanted with soy on the left is a red-brown shade, and the well-loved but unmordanted silk fabric (previously a precious shirt handmade for my friend) is a lovely red-orange. This madder bath didn’t begin to give orange until it was on its third exhaust bath. After that, I kept dyeing with it until I got down to peach on some handspun wool and banana fibre blend.